Abstract: The newly-defined seismogenic zones in the Alpine-Carpathian-Pannonian (ALCAPA) junction area are correlated with: (1) paleoalpine deep-seated suture zones, either oceanic or intracontinental, (2) neoalpine wrench-fault zones following some sutures, and (3) original thrust planes reactivated as low-angle extensional normal faults. 1–The principal West-Carpathian paleoalpine sutures, from north to south, are: the Penninic-Vahic oceanic suture originated during the Late Cretaceous, the Certovica intracontinental suture between the Tatric and Veporic thick-skinned sheets locked some 90 Ma ago, and the Meliatic oceanic suture formed in the Late Jurassic, closely related to the Igal-Bükk zone. These suture zones were partly reactivated during the Late Tertiary and represent weakened zones in the modern upper crust. Concentration of important earthquake epicenters correlates well with these weakened belts which serves as a base for the new seismogenic model of the area. 2–The most important wrench fault zone is situated between the Eastern Alps and Western Carpathians. It reflects the Miocene extrusion of the ALCAPA lithospheric fragment from the Alpine domain as its northwestern boundary. The NE-SW trending wrench fault zone is represented by the Mur-Mürz-Leitha and Povazie fault systems. The zone is well expressed by flower structures in many seismic lines. 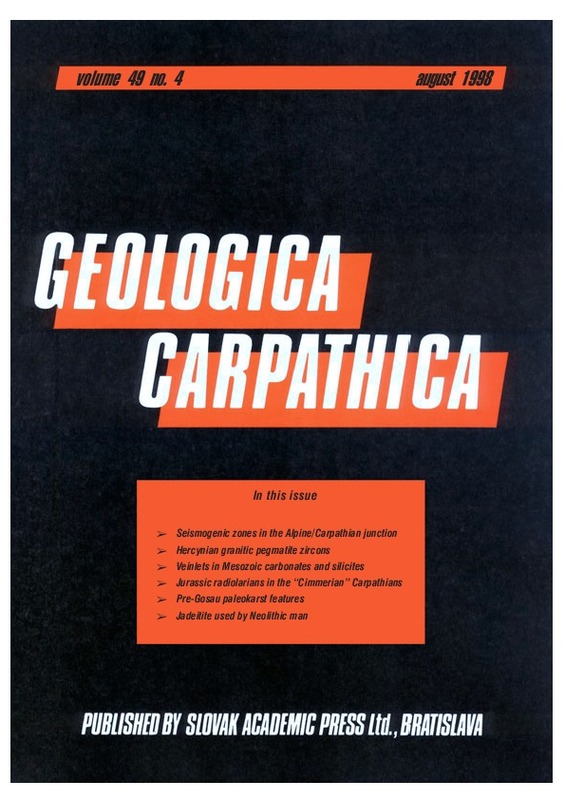 3– The Miocene back-arc extension driven by the subduction pull in front of the Carpathian orogen and mantle updoming in the Pannonian domain reactivated original paleoalpine thrusts as crustal detachment planes. In the Danube Basin area, these are accompanied by numerous important faults visible in seismic sections, e.g. the Repce, Raba, Sladkovicovo and Mojmirovce fault systems. the extension regime consequences of the core-mountains uplift during isostatic inversion from the Pliocene are visible in seismic section 2T – along the Certovica zone as a strong reflector branches. They represent former suture rejuvenated into younger low angle normal faults. Abstract: Zircon is an uncommon but widespread accessory mineral in Hercynian barren to beryl-columbite rare-element granitic pegmatites of the Central Western Carpathians, Slovakia. BSE images show either homogeneous composition, or irregular to oscillatory zoning, and locally also two-stage crystal growth. Electron-microprobe analysis reveals elevated Hf, locally also P, Y, REE, Al, Fe and Ca. Hafnium content and Zr/Hf ratio are proportional to the fractionation degree of the host pegmatite; zircon from the barren pegmatites attains 1 to 8 wt. % HfO2 (average 3 wt. %), zircon from the beryl-columbite pegmatites contains 2 to 22 wt. % HfO2 (average 7 wt. %). HfZr-1, Al3+P5+Si4+-2 and (Y,HREE,Fe)3+P5+(Zr,Hf)4+-1Si4+-1 are the possible substitution mechanisms. Calculation of the temperature of zircon saturation gave TS ≈ 700 to 580 °C, which corresponds to a primary magmatic origin of the zircon. Abstract: Many veinlets in carbonate rocks considered as open crack fillings, are the result of recrystallization (dashed veinlets formed by the shear, whitened veinlets). Synsedimentary and early diagenetic veinlets may be folded in a soft sediment deformation or deformed by brittle fragmentation. They may also fill desiccation cracks, bedding - parallel joints and synsedimentary cracks with internal sediment (microdykes). Synaeretic cracks in bedded silicites and nodular cherts can be filled with calcite partially infiltrating the still reactive silica masa (pearl-string type veinlets, bordered veinlets), filled by chalcedony, or can disappear being healed by neighbouring silica mass. Relative dating of veinlets with regard to the formation of authigenic minerals, formation of chert nodules, conglomerate deposition, calcite twinning, microstylolites etc. is possible. Authigenic quartz, feldspars, pyrite, illite, baryte, fluorite and galena found in calcite veinlets are mentioned. From the commonly occurring dedolomitized saddle dolomite in calcite veinlets, the burial depth of the Krizna Nappe was estimated. Abstract: Up to now the data about the age of radiolarites of the Silica Nappe in the Slovak Karst has been established by Dumitrică (in Dumitrică & Mello 1982) as Callovian-Oxfordian in the locality Bohunovo. In the Drienovec Mt., at the locality of Bleskovy pramen near the village of Drnava radiolarites with Upper Bathonian-Lower Callovian radiolarian microfauna also occur as lithoclasts in carbonate breccia of debris flow deposit origin (Sykora & Ozvoldova 1996). Apart from this finding the presented paper brings the further information about the age of the radiolarite in this locality, based on the radiolarian research. The radiolarian assemblages represent the stratigraphical range – latest Bajocian-early Bathonian to upper Bathonian-early Callovian (Unitary Association Zones: U.A.Z. 5 - U.A.Z. 7 according to the biozonation of Baumgartner et al. 1995). Abstract: The considerable areal extent and a great thickness of Middle/Upper Triassic carbonate sequences favourably influenced the development of paleokarst during the Paleoalpine karst period in the Brezovske Karpaty Mts. Carbonate formations provide data concerning the first-pre-Gosau-phase of the Paleoalpine karst period. Freshwater limestones, bauxites, reddish ferrugineous silty clays, Valchov Conglomerates, shallow doline-like depressions and deeper canyon-like forms represent the most important pre-Gosau karst sediments and forms. Abstract: In the area limited by villages Kunov-Sobotiste-Podbranc (Western Slovakia) Neolithic population is documented by archaeological artefacts. Among them Early Linear Pottery of the Baden culture, together with numerous polished stone artefacts document the time period from the Early Neolithic to the Middle Aeneolithic (Jamarik 1961; Pichlerova 1961; Pavuk 1963). Among the polished stone artefacts, one made from jadeitite is unique by its raw material. Electron microprobe study of the raw material of the axe as well as results of detailed studies from the northern Italy and the Western Alps area showed that the rock under consideration underwent a complicated geological history. Occurences of this type of raw material have not been recorded in the Eastern Alps, the Bohemian Massif or in the Western Carpathians. Thus it is supposed that ready-made product was imported from distant areas, such as NW Italy.